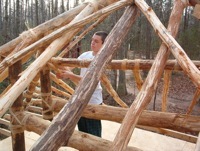 Shepherd’s Hill Academy combines the best of a Christian boarding school and a therapeutic wilderness program. The unique program at Shepherd’s Hill Academy offers the best therapy concepts in one effective program. Teens experience wilderness therapy as they learn about life, God and working together, while they also attend a fully accredited school. The therapeutic program also includes professional counseling, equine therapy, and teamwork/trust exercises. Shepherd’s Hill Academy pulls the best therapeutic elements of other therapeutic programs into one effective residential program, combining a wilderness experience and counseling, with a top notch education. It’s staff consistently model God’s love and truth for the teens, mentoring them and whetting their appetites for positive choices and activities. They embrace a Christ-centered approach to life. Although the operation of their school resembles a typical, modern schoolroom, they purposefully immerse teens in primitive surroundings to remove the distractions and negative influences of the modern culture. Instead of succumbing to peer pressure, teens learn to think critically about their lives, from the everyday choices to the more critical life issues. They learn the difference between knowledge, intelligence and wisdom and then apply those differences in real life situations. Students at Shepherd’s Hill Academy get to enjoy their childhood again. At the same time, they learn to approach adulthood with wisdom and maturity. Shepherd’s Hill also nurtures families through parent retreats and by keeping families closely involved with the progress of their students. SHA’s Wilderness Program provides teens with an opportunity to be challenged in maturity. The unique benefit of the Wilderness Program is that the child is removed from the temptations present to them in today’s culture. During this separation they are able to mature in character development. If you are looking for your child to be in perpetual comfort, a wilderness-style program may not be for you. However, if you are looking for perhaps your child’s greatest opportunity for healing and a diminished sense of entitlement, all while creating for himself a sense of significance, identity, humility, and gratitude, then SHA may be a fit for your teen. Science, statistics, and history, all give evidence for the effectiveness of wilderness-style care toward heart change. And with a Christ-centered approach, the results improve exponentially. Everything SHA does is designed for therapeutic value and teachable moments–whether it is in school, sports, work, or in the wilderness area. SHA’s teachers, campus therapists, program supervisors, and residential staff are all unified in your teen’s therapeutic goals and regularly meet to discuss progress. Their 24/7 care provides teenagers with the opportunity to grow spiritually, mentally, emotionally, and physically, through individual, group, and family therapeutic activities and counseling. Therapeutic programs and schools providing treatment for troubled teens. Includes a list of therapeutic boarding schools, the best residential treatment programs for teens, wilderness programs, outdoor therapeutic and adventure therapy programs, young adult programs and programs working with troubled teens and troubled adolescents. Boarding Schools (Emotional Growth Schools and Therapeutic Boarding Schools) provide supervision and counseling for at-risk teenage boys and girls. Each therapeutic school will vary in their approach to the emotional and behavioral needs of the adolescent. Individual, group and family therapy are a part of the milieu. Outdoor Behavioral Health (Wilderness Programs and Outdoor Therapeutic Programs) incorporate a blend of therapeutic modalities in the context of wilderness environments and back country travel. Outdoor behavioral health programs apply wilderness therapy in the field.Residential Treatment Centers offer clinical treatment with both academic and behavioral support, plus medication management and medical monitoring. They treat adolescents with serious psychological and behavior issues, are highly structured, and they offer recreational and adventure activities. Specialty residential treatment centers are often a part of psychiatric and behavioral hospitals. Need help finding a Therapeutic Boarding School that may potentially best fit your teen’s needs? INQUIRE NOW!